Enjoy a significant discount on a New Volkswagen model by driving away in a demo Volkswagen from Westpoint Volkswagen. 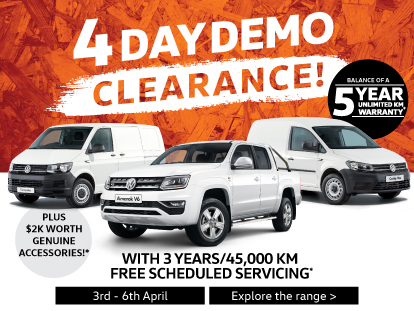 All of our demo Volkswagen vehicles for sale in Indooroopilly are in excellent condition and offer the benefits of a new Volkswagen, without the new car price tag. Browse our range of demo Volkswagen cars for sale Indooroopilly. To book a test drive or for more information, please don’t hesitate to get in Contact with a friendly member of our team today. *1.99% p.a. comparison rate only available to approved personal applicants of Volkswagen Financial Services (VFS)* on selected new and demonstrator MY18 and MY19 Tiguan and Tiguan Allspace stock vehicles. Excludes: Tiguan 110TSI, Trendline, Tiguan 110TSI Comfortline, Tiguan Comfortline 110TDI and Tiguan 140TDI Highline. Maximum 36 months. A lump sum agreed at the time of the loan (“balloon”) may be owed to VFS* at the end of the loan after all monthly repayments have been made. Vehicles sold by 31/03/2019. Customer delivery by 30/04/2019. Finance applications received by 31/03/2019 and approved by 30/04/2019. Offer ends 31/03/2019. Excludes other offers. While stock lasts. Standard fees/charges and further conditions apply, available from VFS*. VFS* may withdraw or change this offer. Comparison rate based on 5 year secured consumer fixed rate loan of $30,000. WARNING: This comparison rate is true only for the examples given and may not include all fees and charges. Different terms, fees or other loan amounts might result in a different comparison rate. Dealer may charge an administration fee to arrange finance, ask dealer for information. **VFS is a trading name of Volkswagen Financial Services Australia Pty Limited ABN 20 097 071 460, Australian Credit Licence Number 389344.